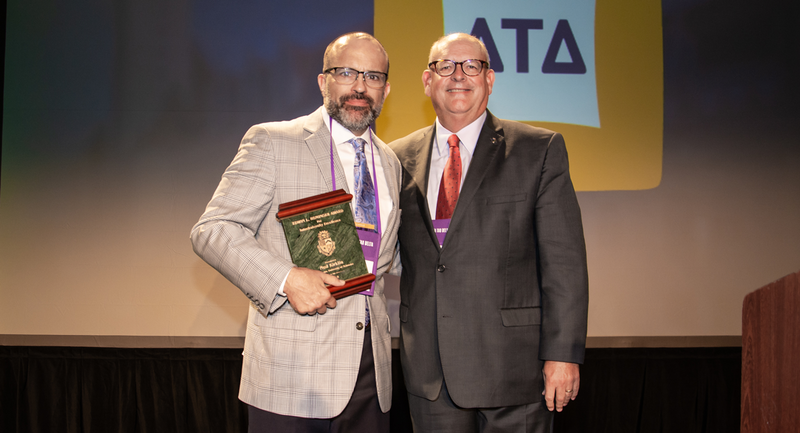 Ned Kirklin, a pioneer and long-time leader in risk management education and prevention within the Greek community, is the 2018 recipient of Delta Tau Delta Fraternity’s Edwin L. Heminger Award for Interfraternal Service. The Heminger Award recognizes those men and women who have devoted their life’s work as faithful and visionary leaders in the interfraternal community. Kirklin was presented the award Aug. 3 at the 94th Karnea of Delta Tau Delta in St. Louis. He is the 10th recipient. Kirklin serves as executive vice president of Holmes Murphy, a national insurance brokerage representing business clients in many endeavors. In that role, his responsibilities include client advocacy, insurance program development, and innovation, as well as carrier relationship development and retention. He also is the administrator of FRMT, Ltd. which provides liability, property, and directors and officers coverage to 33 men’s fraternities, including Delta Tau Delta. He also represents a number of other fraternities with independent coverage. His brokerage, founded in 1991 and first known as Kirklin & Co. LLC, has played a significant role in providing risk management prevention education and the dissemination of best practices to headquarters staffs and national fraternity and sorority boards. Kirklin is a graduate of the University of Nebraska where he earned a degree in business administration in 1987 and was initiated into Kappa Sigma Fraternity. He began his career in the insurance industry with Corroon & Black of Illinois, Inc. in 1987. While in Chicago, he earned a Master of Management degree from the Kellogg Graduate School of Management at Northwestern University. The award is named for the late Edwin L. Heminger (Ohio Wesleyan University, 1948), former international president of Delta Tau Delta and former chairman of the Delta Tau Delta Educational Foundation. A highly respected newspaper publisher in Findlay, Ohio, Mr. Heminger began his post-collegiate career on the Delt field staff. Later a career Delt volunteer, he worked tirelessly throughout his life for the betterment of the interfraternal movement. He served as president of the North-American Interfraternity Conference in 1986, the fifth Delt to earn that distinction. Founded in 1858 at Bethany College, in Bethany, W.Va., Delta Tau Delta has 132 chapters and colonies in 39 states and the District of Columbia with a membership of more than 9,500 undergraduates and 120,000 living alumni. The Fraternity posts a GPA of 3.129, making it one of the highest achieving men’s fraternities academically.